STIHL introduces another world's first - a cut-off machine powered by 36-volt Lithium-Ion battery technology. 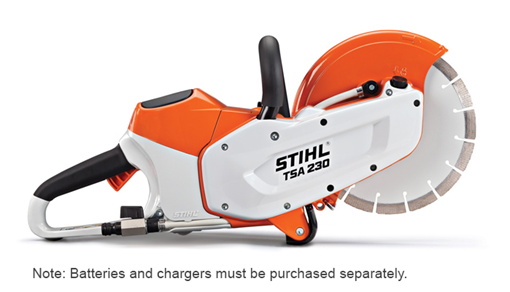 The TSA 230 STIHL Cutquik® cut-off machine starts instantly and changes the game for the jobsite, delivering maneuverability and solid cutting performance in a lightweight, compact package that can be used indoors. Its onboard water control helps suppress dust while a toolless wheel lock prevents wheel rotation when removing the wheel attachment bolt. And because it is battery powered, there is no air filter to maintain. The TSA 230 even provides great value - priced below its gasoline-powered counterpart. Groundbreaking innovation, grounded in quality engineering.